One of the many reasons for setting up the company Greendoor is to pursue an environmental ethos. 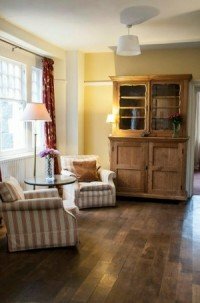 We have already managed to reduce our electricity consumption to under 45 kilowatt hours per day; for a building that is over 1,000 square metres that is very impressive, all the more for the fact that we have increased the number of people that stay here per annum, both on a bed and breakfast basis, as well as self catering. One of the very first ideas that we had when we purchased in September 2008, was to utilise all the woodland under management in the valley. Harry applied for – and was granted – a grant from the Department of Energy and Climate Change to install a log-burning biomass boiler to produce all the heat and hot water for the business. Exactly 12 months after we first thought about this, we “cut turf” for want of a better description, and by 11th December 2009, we were ready to commission our new boiler. I hasten to add that we have not removed or uninstalled the oil boiler, but merely use oil as a back-up. Now for the technical bit. When we first bought the House, the boiler was using approximately 175 litres of oil a day to keep the building warm and provide the hot water; at a (then) rate of 75 pence per litre of oil, this was a seriously expensive option. We replaced the 54 year old boiler with an ultra efficient Remeha boiler rated to 320 kilowatts (1,000,000 btu in old money) which reduced our oil consumption to approximately 70 litres of oil a day (as an average). This still wasn’t good enough, hence the log-burning option. We will now burn approximately 100 cubic metres of logs, all sourced from less than 1 mile from the House (i.e. very little transportation), and expect to save 42.5 tonnes of CO2 a year as a result of not burning fossil fuel oil. Bear in mind that the wood that we burn takes between 15 and 30 years to grow, and oil takes 60 million years to produce.. In fact, between 11th and 31st December 2009 (21 days), the average air temperature in Eskdale was 0°C, with most nights being as low as -4°, and quite a few days being not much above freezing. To heat the building, and produce the hot water, we would have used 120 litres of oil a day (that with the new oil boiler); infact we used 75 litres and approximately 4 cubic metres of wood. This equates to a saving of 6.96 tonnes of CO2, or 16% of our expected savings per annum. The final stage is that we are now processing our own logs; we purchase wood in 2 to 3 metre lengths, and with our firewood processor, we now produce the exact size of log that we need to burn the biomass boiler as efficiently as possible. Our local village primary school in Eskdale Green is also benefitting as we are processing the logs that they need for their biomass boiler; this was agreed as part of the grant that we received for the purchase of the firewood processor. Our thanks in this project go to very few companies, but each in turn played a major role in building and commissioning the boiler, and all showed dedication and enthusiasm in something that is relatively new in this country, but should hopefully become more widespread. 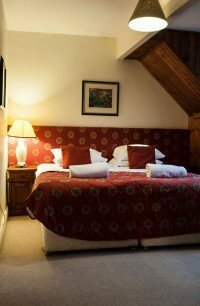 ....more than just bed and breakfast; the rest is on the doorstep.